Combat Crunch bars by MusclePharm have a superior taste and texture satisfying your sweet tooth while giving you an energy and protein boost! 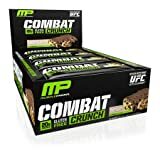 MusclePharm’s proprietary baking process makes the Combat Crunch bars taste better than other protein bars and less “taffy-like.” These fiber-full Combat Crunch bars have low active carbs and are high in protein, fueling your workout or sports activity. The unique soft-baked cookie texture of the Combat Crunch bars will make you never want any other brand of protein bar again!